Viasat Inc., (Nasdaq: VSAT) has selected SpaceX to launch one of their ViaSat-3 satellite missions. The Viasat mission is scheduled to launch in the 2020 to 2022 timeframe from the Launch Complex 39A (LC-39A) at NASA’s Kennedy Space Center in Florida. This mission will launch aboard a Falcon Heavy. Viasat selected the SpaceX Falcon Heavy for that rocket's ability to fly a near direct-injection mission, inserting a ViaSat-3 satellite extremely close to geostationary orbit — as a result, the spacecraft can begin in-orbit testing (IOT) quickly after launch, rather than spending weeks or months performing orbit raising maneuvers. This is expected to enable Viasat to turn on its ultra-high-speed broadband service much quicker after launch than is possible with other launch vehicles. 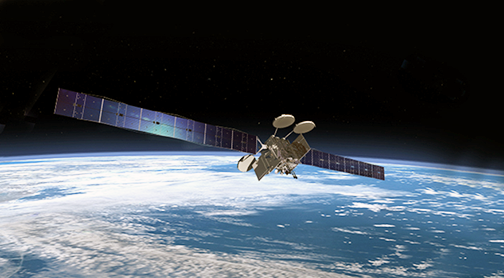 Artistic rendition of the ViaSat-3 satellite. Dave Ryan, President, Space Systems at Viasat, said that the company sought a ViaSat-3 launch partner that understood the firm's unique mission requirements: to safely and quickly bring a ViaSat-3 spacecraft into orbit, to further the company's goal of delivering terabits of data from space to meet growing global broadband demand. Viasat selected SpaceX as that company continues to demonstrate their commitment to advancing space technologies. Their proven technology is powerful and efficient enough to thrust a ViaSat-3 spacecraft close to geostationary orbit. SpaceX President and Chief Operating Officer Gwynne Shotwell added that there are exciting opportunities for Falcon Heavy in the market, particularly for customers such as Viasat that need direct-injection extremely close to geostationary orbit.